TOKYO, Japan, September 14, 2012 (ENS) – The Japanese government has decided to phase out nuclear power by sometime in the 2030s and shift the country in the direction of renewables, energy conservation and natural gas. There will be a 40-year limit on the lifespan of nuclear power plants, no new plant construction and no expansion of existing nuclear power facilities. Prime Minister Yoshihiko Noda and his cabinet adopted the new energy policy Friday in the wake of the nuclear fuel meltdown at the Fukushima Daiichi nuclear power plant in March 2011 that spread radiation across a wide area of the earthquake-prone country. Triggered by an earthquake and tsunami, the Fukushima accident forced the evacuation of hundreds of thousands of nearby residents and changed public acceptance of Japan’s reliance on nuclear power to intense public opposition. 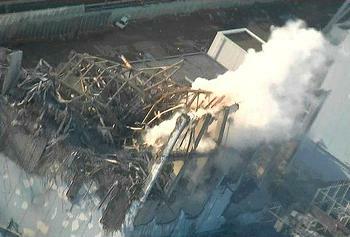 Cleanup of the damaged nuclear power plant is ongoing. Japan had been third in the world in the number of nuclear reactors, with 55, after the United States, which has 104, and France with 58. The Noda government has decided to put Japan’s existing nuclear reactors into operation after a new nuclear regulatory commission to be launched next week certifies their safety. Many of Japan’s nuclear plants have been closed, or their operation has been suspended for safety inspections following the Fukushima Daiichi meltdown. The last of Japan’s 54 reactors (Tomari-3) went offline for maintenance on May 5, 2012, leaving Japan completely without nuclear-produced electrical power for the first time since 1970. Despite protests, on July 1 unit 3 of the Ōi Nuclear Power Plant was restarted. Today, Ōi units 3 and 4 are Japan’s only operating nuclear power plants, although the city and prefecture of Osaka have requested they be shut down. Prior to the earthquake and tsunami of March 2011, and the nuclear disasters that resulted from it, Japan generated 30 percent of its electrical power from nuclear reactors and planned to increase that to 40 percent. Regarding Japan’s nuclear fuel recycling business in Aomori Prefecture, the government has decided that the reprocessing plant for spent nuclear fuel will continue to operate. He said the government will find a location for the final disposal of nuclear waste outside Aomori Prefecture. After the Cabinet meeting Prime Minister Noda told reporters that Japan will face challenges as a result of this decision. He said the country will move to renewables and fossil fuels by getting contributions from the public, using new ideas and sharing the burden. Since June the government has been debating a policy that will see conversion the country’s energy structure to one consisting of renewable energy and natural gas in the end. At the same time the government will work towards reducing dependence on fossil fuels to the minimum and reducing emissions of the greenhouse gas carbon dioxide, emitted by burning fossil fuels. Greenpeace Japan today cautiously welcomed the Japanese government’s new energy and environment strategy of zero nuclear reactors in the 2030s, but warned that 18 years is still too long to keep the country’s nuclear plants online at the risk of public safety. “The government’s strategy involves a nuclear phase-out nearly two decades later than needed, It also provides clarity for the business community that renewable power, not nuclear, is the future,” said Kazue Suzuki, Greenpeace Japan nuclear campaigner. “The government must use its new energy strategy as a starting point for a far more ambitious renewable policy, greater energy efficiency measures, and increasingly bold strides towards the sustainable green economy that will secure Japan’s future prosperity,” Suzuki said.